In a night that’s a little bit eclectic, featuring rap and punk, but lots of raw energy, the Head Of Steam is the perfect host to a show put together by Urban Fox, as Lingua Vulgaris, Fire Lady Luck and The Rez all play on Thursday 28th April. Fresh from supporting Dub Pistols; genre-bending, attitude-filled, rap vagabonds and talented noise merchants Lingua Vulgaris are sure to be a live spectacle. One of the most entertaining local acts, seeing them up close and personal is a real experience. Supported by superb melodic punk from The Rez and fiery, emotive punk rock from Fire Lady Luck, it all makes for an intimate show that’s showcasing some underrated talents of our region’s delightfully varied music scene. 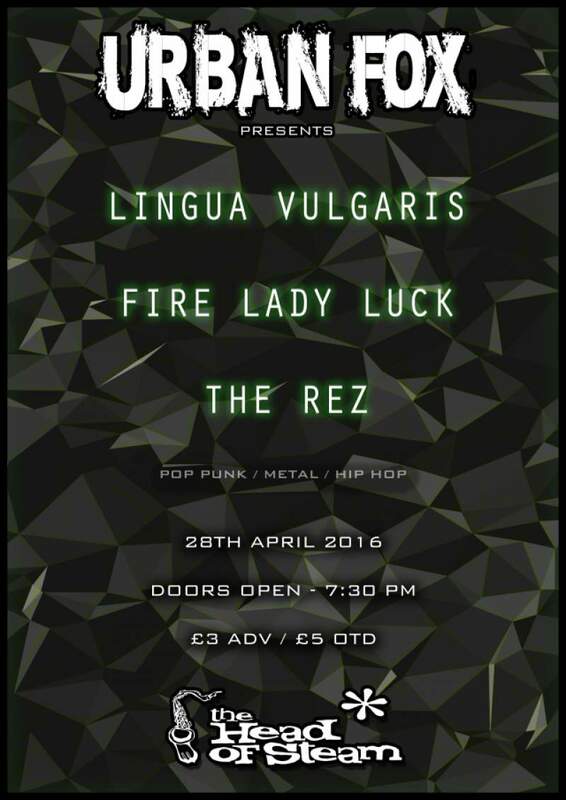 Lingua Vulgaris, Fire Lady Luck, The Rez play Head Of Steam, Newcastle on Thursday 28th April.